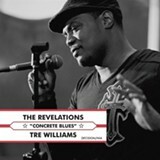 I just received "Concrete Blues" a new release by The Revelations featuring Tre Williams. I've been listening to this recording for a couple of days and I really like it. It is solidly rooted in the traditional soul music but with updated sounds and syncopation of a contemporary recording. Lead vocals are handled by Tre Williams who has a terrific soul voice. His delivery of the title track, Concrete Blues, had me jammin' in my seat and sitting back smiling. It's always nice to hear someone pickup where some of the greats like Al Green have cut the path. I know that my blog says "Blues" but as I have said many times, I don't know what Blues Music is ... but I do know what good is. This is it! Music that makes me stop and listen instead of just working on... music that makes me look at the cover to see what and who... music that makes me groove. I didn't grow up in Philly or Detroit but I do know good soul music when I hear it. For the more pure blues lovers there are some nice ripping blues guitar riffs by Wes Mingus and a solid bottom from drummer Gintas Janusonis who are joined by the brothers "Teenie" Hodges on guitar and Charles Hodges on organ who are know for their work with Al Green. Session musicians James Alexander of the Bar-Kays played Bass and Lester Snell of Isaac Hayes Movement popped in on piano. The recording includes 8 new originals as well as two cover tunes, "Until You Get Enough of Me", a Ronnie Lovejoy tune and "Don't Walk Away" previously released by the great Johnnie Taylor. The recording also includes 3 bonus tracks from 2009 top selling release "The Bleeding Edge". The Revelations are really putting it out there having shared the stage with Latimore, Bobby "Blue" Bland, Denise LaSalle, one of my favorites Lenny Williams, Otis Clay, Bobby Rush, Swamp Dogg and and recently deceased J. Blackfoot. I hope that you enjoy this recording as much as I do.